Wow, Amazon threw us a surprise today – not just a new Kindle Fire 2, but three new Kindle Fires! And a price drop on the original to boot. First let’s take a look at the new Kindle Fire HD. This is a 7 incher, like the original. But now we get high-def. We aren’t talking retina-display iPad quality here – but it should definitely give us a good reason to pick up Amazon Instant Videos on HD now. 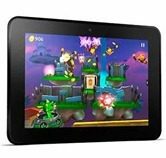 The 7 inch Kindle Fire HD will cost $199, is available for pre-ordering at Amazon now, and is scheduled for a September 14th release date. Next up is a super-sized Kindle Fire – this one’s 8.9 inches and also high def. The Kindle Fire HD 8.9 will come in two versions, a Wi-Fi model and a 4G model. The 8.9″ 4G model with 32 GB of storage will ring up at $499. The new, top-of-the-line, 8.9″ Kindle Fire 4G with 64 GB of storage is priced at $599. Both of the 8.9″ models are available for pre-ordering now with a September 20 release date. The price for a standard 7″ Kindle Fire is dropping to $159. The ‘standard’ Fire is a bit different than the original model though – double the RAM for one thing. It’s also available for pre-ordering now and is set for a September 14th release date. We will have much more about the new Kindle Fires over the next few days and leading up to their release dates. Stay tuned to Consumer Press on Twitter or Facebook for the latest. What do YOU think of the new Kindle Fires from Amazon? Leave your comments below.